7 Jan 2016 — Reza Aslan's book separates Jesus the man from Jesus the myth and examines how the latter has developed. Because of the ancient topic, the author has to be detective, historian, and bard at once. The cover features a close-up of an idealized depiction of Jesus. I bought this book in the December before last, intending to blog about it on Christmas. The year 2015 AD / CE was going to be my second chance, but I missed this past Christmas, too. The 7th of January gives me a mulligan, though: it’s the Orthodox Christian observance of Jesus’s birth. Technically, today is the 25th of December on the Julian calendar (BBC). Regardless, Christianity is going strong more than 2,000 years later. Jesus was a peasant from the village of Nazareth in the region of Galilee. I can’t remember if Nazareth is stated as the historical birthplace of Jesus, but in any case, “Jesus of Nazareth” becomes his sobriquet. Initially, Jesus plied his family trade as a carpenter in the growing cities near his home. He eventually became an “itinerant preacher” throughout first-century Palestine and amassed a following that viewed him as the vaunted messiah of his people. The messiah was expected to, essentially, make the Jewish nation pure. The first of his feats would be to remove the Roman occupation of the land and the priestly control of Jerusalem’s Temple. Jewish nationalism in the form of armed rebellion was common in Jesus’s day; the words zeal and zealot were borne of this time. Others had messianic and kingly aspirations before Jesus, but they didn’t have his profound, though posthumous, influence on humanity. We remember Jesus, less for his actions while alive and more for the astute efforts of his followers to make interpretations of his actions meaningful to others in the decades following his death. 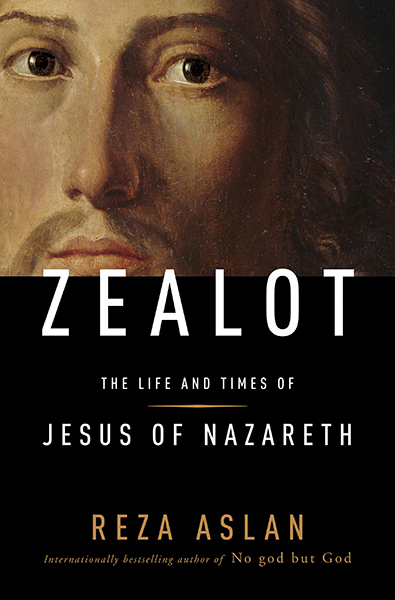 I’ve learned a lot from reading Zealot; I could spend all day summarizing it. My takeaway is why some of Jesus’s early followers have changed his narrative from being a militant peasant focused on Jewish independence to a benign god uninterested in human conflict. The eventual destruction of Jerusalem by Roman forces in 70 CE led the cult of Jesus to distance itself from the nationalistic doctrine of their founder who had been crucified for it. Some time after Jesus’s death, there were two different schools of thought. The more established one was led by James, Jesus’s younger brother and one of the Twelve apostles. James the Just, as he was known, was widely respected and preached observance of Jewish law, even though Jesus had once famously protested Temple proceedings. James was old school, in other words. The other school of thought was led by Paul, a convert previously known as Saul who had supported, even if tacitly, the martyrdom of Stephen. Paul denounced the Jewish establishment and was, not surprisingly, eventually forced to renounce his teachings. However, the mentioned destruction of Jerusalem led to Paul’s interpretation of Jesus’s existence to have more influence as Christianity grew. Aslan makes a point that the historical Jesus is worth admiring. I agree. Among other things, he championed the poor and the weak. His story, both the actual and metaphorical parts, has inspired people to be righteous and understanding. Even for non-Christians, the presumed day of this birth is a holiday in a large part of the world, and the presumed year of his birth is the point of reference for two millennia of history. Not bad for an illiterate carpenter from a remote village with a few hundred peasants.